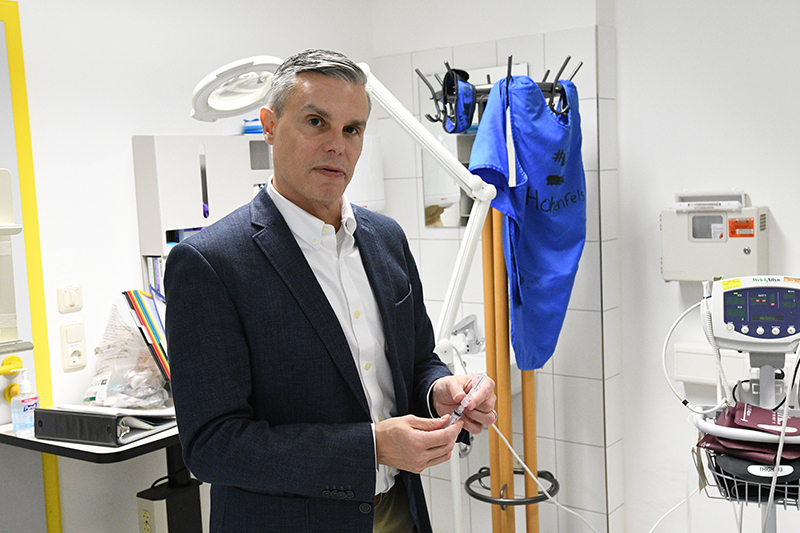 VILSECK, Germany — When it comes to infection prevention, Joey Scaletta, a nurse consultant for infection prevention and control for U.S. Army Medical Department Activity Bavaria, is passionate about his job and how he is able to influence good habits to those he coaches and works with. Scaletta, a native of Baltimore, Maryland, has been part of the MEDDAC Bavaria organization since September 2016. His background in infection prevention goes as far back as 1991 when he first began his career as an epidemiologist, a public health professional who analyzes and studies the distribution of infectious diseases in order to treat existing diseases and prevent future outbreaks. “Infection prevention is a broad science — including microbiology, nursing, pharmacology, infectious disease — and we use all of those disciplines to make patient care safer, and to provide good quality care for our patients,” said Scaletta. Scaletta worked several years as an infection control epidemiologist for the Maryland Department of Health. As time passed, he decided to move to Kansas and apply for position working with the Kansas Department of Health and Environment as their director of Healthcare-Associated Infection Program. He quickly realized working in infection prevention and control in Kansas was not going to happen. “When I got to Kansas I was very promptly told that only nurses in Kansas do infection control,” said Scaletta. Not allowing this setback to discourage him, Scaletta did something about it. “I went back to nursing school at age of 34, and got a nursing degree and back into the profession I love,” he said. Scaletta’s journey to MEDDAC Bavaria began when a friend of his, who was working in Germany, called him January 2016 and told him about the position of infection prevention and control that was about to become available to applicants and encouraged him to apply for the position, which he did. Nine months later, Scaletta, who never saw himself working for the military, began his civilian-military career with MEDDAC Bavaria as its nurse consultant for infection prevention and control. His impact on MEDDAC Bavaria is felt throughout the entire organization, to include the organization’s five Army health clinics he visits at least twice a quarter. As the lone nurse consultant for infection prevention and control for MEDDAC Bavaria, biggest challenge Scaletta faces is coordination with all five health clinics due to the complexity of healthcare and its fast pace. For Scaletta, communication is the key in ensuring MEDDAC Bavaria personnel are doing the right thing and that they are continually practice good habits. He is always reminding people to do the right thing, such as washing their hands to help reduce and minimize the spread of germs to a patient. Often times he will talk one-on-one with clinic personnel, whether it is the healthcare provider or a nurse, and ask the individual to walk him through the process of what they are doing. Scaletta, who operates alone, does have some help in keeping MEDDAC Bavaria infection free. Each clinic has an infection prevention and control facilitator, an additional duty assigned to a clinic personnel, who handles the day-to-day operations of infection prevention and control for that clinic. For Scaletta, working with each IPAC facilitator is the most rewarding aspect of his position.